Remember as you plant this season to rotate your crops. One of the keys to organic pest control and healthy growth is to rotate crops. I always keep a garden journal of where I planted each year and the results, that way the next year I can see what works and make sure I rotate crops. Now if you didn't do this, that's ok, just make your best guess and then make sure you keep track this year. So here's some easy bed rotations: You can rotate in 1/2's , 1/4's or Sideways. With 1/2's you just flip flop sides each year with your crops (good for just a few crops). 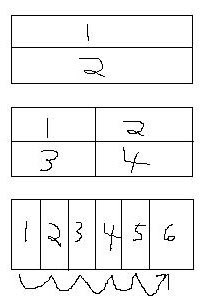 With 1/4's you just rotate from 1 corner to the next, etc... (good for 4 or more crops) And with sideways rotations you just rotate from right to left in sections (good for multiple crops-base number of sections on number of crops). Now there are ways to extend your season (see past posts), but for now here's a basic plan for 3 raised beds. That should get you started for now, my next post will cover part 2.